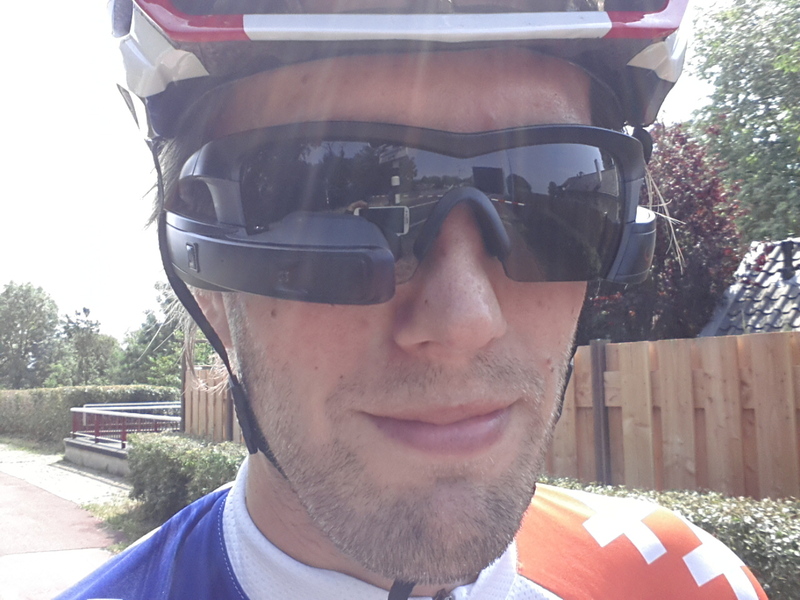 With more and more wearables it was only a matter of time before the Google Glass concept was adapted to sports. Metrics are becoming more and more important as we learn how to train better using all this (new) data. 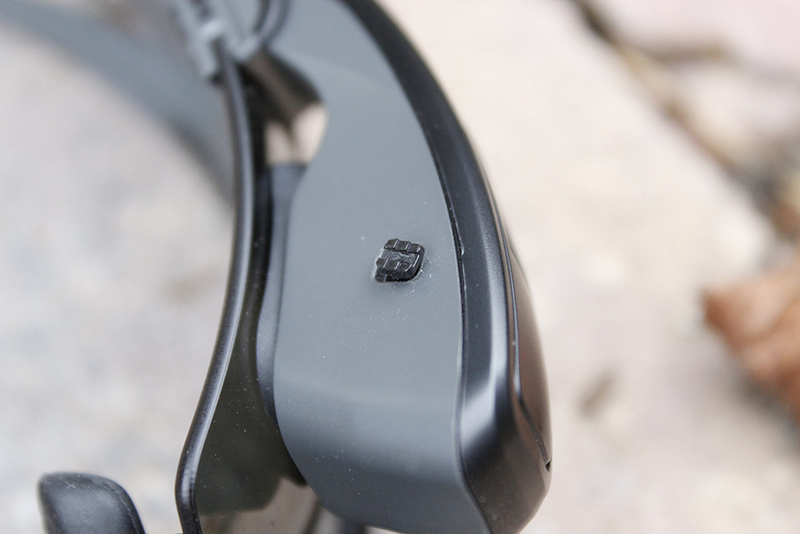 The Recon Jet is a set of sunglasses with a HUD (Head Up Display) allowing you to see that data in a glance. It’s the first in it’s class and over the last couple of weeks I got to tinker around with it. My first impression was that, weighing in at 3 oz. (or 85 grams), it seemed a bit heavy. Maybe too heavy to comfortably sit on your nose, but wearing it I must admit that this is not really noticeable. Most importantly I think Recon got the balance right. The Jet doesn’t want to slide off or leans back too much. The screen takes little getting used too, but after a couple of minutes it becomes second nature. The right adjustment is key here, more about that later. Here is me wearing the Jet and two other shots. The rocker button, for select / back and power on or off (long hold). And on the side there’s the optical touchpad ‘button’. Being optical you can use it even with your gloves on, in the rain, dark, snow, anything. I encountered a small issue before I got my haircut, that, during my run, my hair passed the touchpad and selected a different display. But to resolve this, you can just get a haircut or wear a hair band, it’s worth it. Besides the display which is the main feature, the Jet tracks GPS and can connect to ANT+ sensors (including power meters). I found that the battery life is quite limited. Using it, paired with your phone, sensors and taking the occasional photo, you get only 4 hours, so don’t rely on this during a long distance race or big ride. 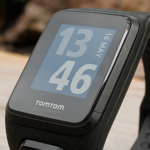 This looks like a bit of a disappointment and really is if you compare it to a Garmin 920XT or Polar V800. 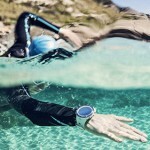 But since Garmin and Polar have had years of completely optimizing their watches I think Recon will catch up quite quickly. If you want to see the full technical specs you can read them here. A shot straight down of my handlebars. An example photo with backlight. So overall, not the best camera, but the addition of it is more a plus than a requirement. If you want nice pictures, you take out your phone or compact anyway. The POV video is fun but also, gimmicky. It’s quite difficult to set it exactly the way you want it, but honestly, you only have to do this once. Spend three minutes setting it up perfectly and enjoy the Recon Jet. The position differs more per person than you’d imagine, so after the first: “oh yeah try it on!” I became less hospitable as the right position is also important for another nice feature to make your experience better, although still in beta, the Jet can switch the display off when you are looking at the road and on when you are looking at the HUD. It saves on the battery and stops it from being distracting, if you feel that it’s distracting in the first place. So you’ll have to take my word on this. On the HUD you can set all the data fields as you want with the available metrics. This done via the webinterface of Engage. 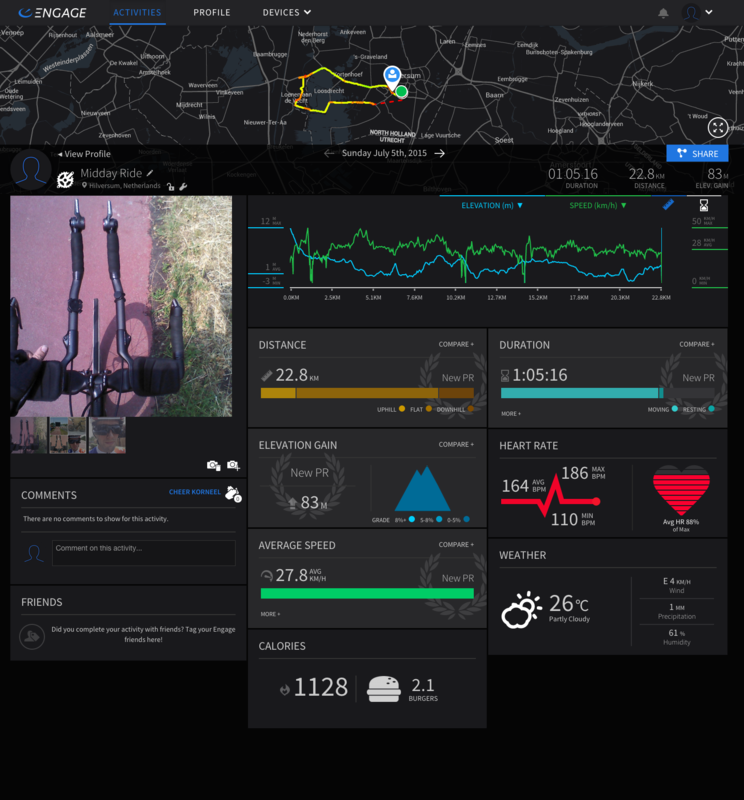 For cycling and Running you have different dashboards, and you can customise up six screens. It’s quite easy, you select the screen, choose a layout and drag & drop your metric to the position of your choice, save it, and after you’ve synced the device, your dashboards are good to go. 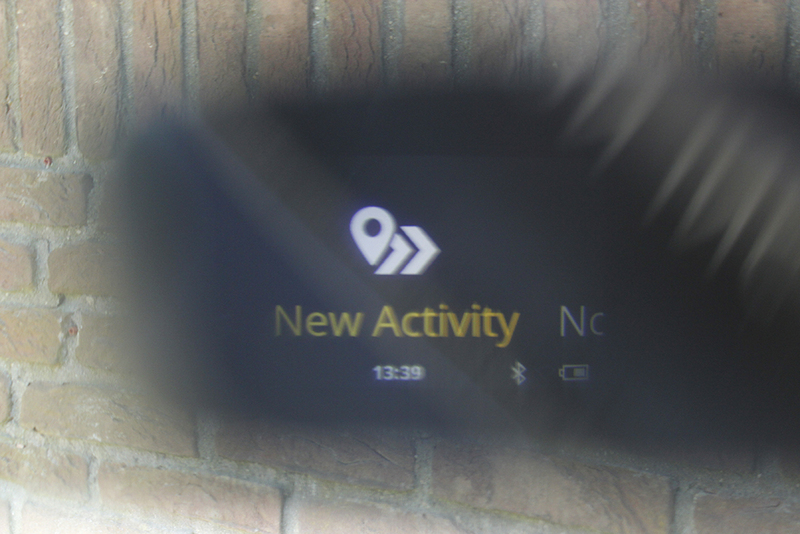 During your workout you can use the optical touchpad to cycle through your dashboards and see your data. The Recon Jet sits nicely just like a normal set of sunglasses. 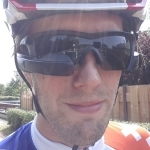 I took the Recon Jet out on my TT and Road bike, as the position of your head is a bit different I was eager to see if this affected how well it stayed on. I’m glad to say in both situations I had no trouble with it. Maybe I had to push it back a tad more often than a normal set of sunglasses, but so very little that I’m not even sure about that. With the Dashboard I could see all the data I like and scrolling is easily done too. You can swipe left and right to change between the compass, your metrics and a map. On your dashboard you can swipe up and down to see your screens. I also went for a run and I must say, I really enjoyed running with the Jet. It’s not too heavy and it certainly beats any watch (in ease of use that is). The data fields you need are right there and you can easily scroll through it too. Add in the maps in case you run somewhere new and it takes away the need to bring your phone too. The open bridge I almost missed. While it doesn’t have navigation, you can get a map overview. This actually saved me from missing a bridge in a small town during a ride. I was supposed to turn left, but was just looking at the town (which was quite pretty). Coincidentally I had the Map on the HUD and noticed the bridge that just behind the building I was passing, saving me from adding 30K to my ride. 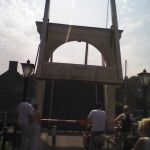 Unlucky me stopped for an open bridge..
As for the navigation, it might come. Recon has an open development platform so it’s an option for third parties to develop or port an app. It looks like the Recon device software is based on Android, so maybe Google Maps could actually be done. 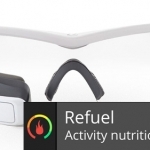 In the total overview, it will automatically show any photos and videos taken during your exercise. Interestingly it also took a mosaic I made to post on Instagram. I’m not 100% sure how it ended up there. Probably via the Mobile Engage App, but then I’m not sure if you can switch that off. A screenshot of a ride. Please click for the full image. As always, the question how easy you can share your rides & runs. Recon can automatically synchronise your sessions with Strava and TrainingPeaks (I believe you need a paid account at TP for that), once setup, you just have to sync your Jet and presto! If you hook up the device to your laptop, it will also synchronise the photo’s and video’s you took to your Desktop. Recon allows developers to build custom apps for the Jet and recently the app Refuel launched. This takes in various data and suggests when to drink and eat. Pretty helpful if you just want to focus on your session. Moreover, it could save your session, as the temperature and your efforts are considered (so it’s not just a timer). Just recently de MyGoproRemote2 app came out, allowing you to control your GoPro with the Recon Jet. Pretty sweet if you ask me, no more leaning over in weird positions on your bike, wondering if the camera is recording or not… the same goes if you own a VIRB. Garmin themselves were kind enough to develop that software. The recon jet obviously isn’t the cheapest device on the block but overall the Jet impressed me with what it’s able to do and mostly it’s potential. Breaking it down, it’s basically a watch on your head and I feel we might be heading in the direction of more integrated wearables like the Jet. It sure is unique and has most features of any other cycling computer. If you like my reviews, you can support me by using the following link to make a purchase, as I get a small fee when you buy something. The Recon Jet is available for $676 on Amazon.